Draft: 2010, Kansas City Royals, 4th rd. Pitching Change: Kevin Chapman replaces James Hoyt. November 2, 2018 LHP Kevin Chapman elected free agency. September 14, 2018 Toledo Mud Hens activated LHP Kevin Chapman from the 7-day disabled list. 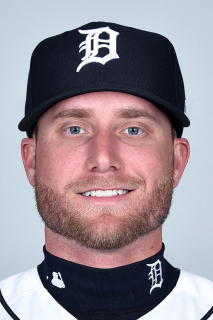 July 3, 2018 Toledo Mud Hens placed LHP Kevin Chapman on the 7-day disabled list. May 22, 2018 LHP Kevin Chapman assigned to Toledo Mud Hens. May 21, 2018 Detroit Tigers signed free agent LHP Kevin Chapman to a minor league contract. June 14, 2017 Rochester Red Wings released LHP Kevin Chapman. May 8, 2017 Minnesota Twins traded LF Danny Santana to Atlanta Braves for cash and LHP Kevin Chapman. May 8, 2017 LHP Kevin Chapman assigned to Rochester Red Wings. March 31, 2017 Atlanta Braves sent LHP Kevin Chapman outright to Gwinnett Braves. March 13, 2017 Atlanta Braves claimed Kevin Chapman off waivers from Houston Astros. September 5, 2016 Houston Astros recalled LHP Kevin Chapman from Fresno Grizzlies. August 12, 2016 Houston Astros optioned LHP Kevin Chapman to Fresno Grizzlies. August 11, 2016 Houston Astros recalled Kevin Chapman from Fresno Grizzlies. March 25, 2016 Houston Astros optioned LHP Kevin Chapman to Fresno Grizzlies. October 15, 2015 Kevin Chapman roster status changed by Houston Astros. October 5, 2015 Houston Astros recalled LHP Kevin Chapman from Fresno Grizzlies. May 13, 2015 Houston Astros optioned LHP Kevin Chapman to Fresno Grizzlies. May 1, 2015 Houston Astros recalled Kevin Chapman from Fresno Grizzlies. April 1, 2015 Houston Astros optioned LHP Kevin Chapman to Fresno Grizzlies. August 15, 2014 Houston Astros recalled Kevin Chapman from Oklahoma City RedHawks. July 2, 2014 Houston Astros optioned LHP Kevin Chapman to Oklahoma City RedHawks. July 1, 2014 Houston Astros recalled Kevin Chapman from Oklahoma City RedHawks. April 17, 2014 Houston Astros optioned LHP Kevin Chapman to Oklahoma City RedHawks. August 9, 2013 Houston Astros selected the contract of Kevin Chapman from Oklahoma City RedHawks. April 1, 2013 Kevin Chapman assigned to Oklahoma City RedHawks from Corpus Christi Hooks. January 17, 2013 Houston Astros invited non-roster LHP Kevin Chapman to spring training. April 2, 2012 Kevin Chapman assigned to Corpus Christi Hooks. March 20, 2012 Houston Astros traded CF Jason Bourgeois and C Humberto Quintero to Kansas City Royals for LHP Kevin Chapman. September 7, 2011 Kevin Chapman assigned to Wilmington Blue Rocks from Northwest Arkansas Naturals. June 8, 2011 Kevin Chapman roster status changed by Northwest Arkansas Naturals. June 6, 2011 LHP Kevin Chapman assigned to Northwest Arkansas Naturals from Wilmington Blue Rocks. July 15, 2010 Kevin Chapman assigned to Wilmington Blue Rocks from Kansas City Royals. July 14, 2010 Kansas City Royals signed Kevin Chapman.